So, its now a year on since levels were removed – and while some are well down the journey and have built their own systems; lots haven’t and there is still a lot of uncertainty. The title of this post is a nod to the well known song (just missing the Winter (and, Fall is Autumn in our case). Still, there’s a bit of creative licence! Anyway, I digress… where does the SIMS Assessment, Performance Suite and Discover fit into this jigsaw now? The obvious point is that we are no longer using levels and points for SATS. According to Rachael Marshman (Product Manager), this is a good thing, the previous version was quite complex and difficult to set up. Now, formative assessment and reporting is supported straight out of the box. This is significant, regular assessment that you are used to can still be done – after all, what you need to do is record knowledge and skills; but the additional functionality gives more focus on what a child does and doesn’t know. The intention from the outset was to build a comprehensive solution for EYFS, which meant that there was also a need to ensure that there were resources to deal with historic data too. Much new functionality has been built, and will continue to be built around the programme of study. The key to making this work was Customer engagement, which is ongoing. The secondary solution is still being built, and the primary version evolved – working with customers to understand their need has been of massive importance. Assessment tracking is about supporting what a school is doing, and the Government want tracking to inform teaching and learning; the lesson planning, and the way teachers are engaging with their students. For all the conflict around the changes to the “system”, this core purpose is sound. At its heart is the difference between summative end of term feedback, and continual feedback – which helps to build a picture of what a child does and doesn’t know. This gives opportunity for much earlier interventions if needed. Still, this isn’t without its challenges. For example, how do you manage the curriculum as a whole? How do you meet the challenge of planning the year by topics. These are School level decisions which need making, procedural changes and possibly even culture changes. The SIMS Assessment solution is trying to bring tools to support Schools through this change process. The Spring release was about data entry; meanwhile the Summer release focused on reporting, including developing discover graphs. Moving forwards, it is all about “how can we make it easier” – with an increasing reliance on feedback. Spring gave subject and strand level functionality; with the overall level from Summer. Initially, the grade sets were showing the year and stage where a child is in relation to the curriculum they are teaching. This was a good grounding, while Summer added a new reporting suite; accessed from the Programme of Study. What analysis is available? The good news for schools is that it is all pre-programed – no additional setup needed. 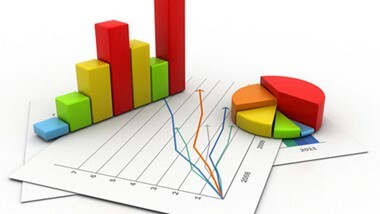 To use the reporting suite, you don’t need to find aspects or result sets. This functionality is powered by the Programme of Study – and uses just two simple options – do I want the overall details, or the individual strand. The selection process is then guided by using check boxes for the included groups. The solution will generate the pattern for you are well. You can drill down into the results, and expand from the anonymous “group” with percentages; to show the individuals – exactly like you can in Discover. The cells are coloured to show the “currency” of the data, and whether it counts towards this year. Crucially, both summative and formative methods are supported. Summative analysis can show the count of students progressing up the grades, as well as use the “mastery” system to indicate whether a student has mastered any subject area. To ensure that the data is not skewed, the results not inflate the percentages or count of steps in moving from 2Secure to 3Emerging without 2Mastered. This, when you think about it, is quite clever – and avoids a potential pitfall. 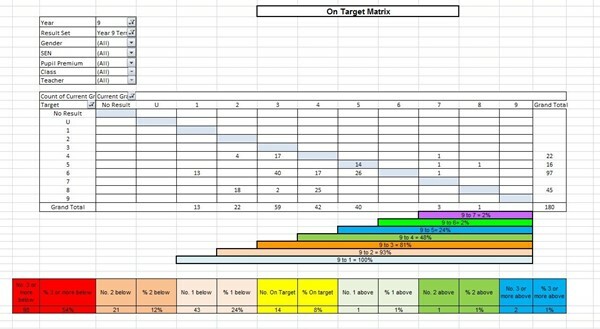 Formative Assessment as an overview by strand is natively supported, and can be shown as a coloured percentage segment. Right click on any bar, showing the students and additional analysis are names or numbers – count or percentages. 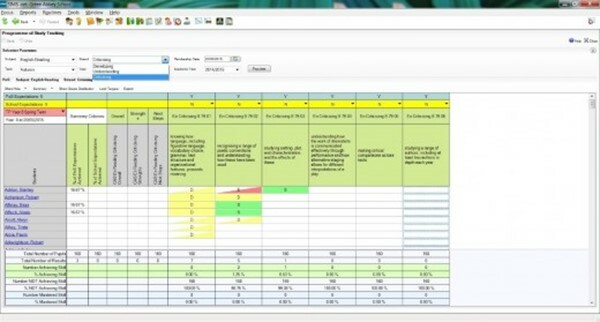 Take this a stage further, and also includes a tracking grid showing all the pupils together, or the groups (FSM,EAL etc) – giving further analysis options. If you are choosing to analyse across multiple student groups, then you can also add registration group, subject sets, user defined groups, and discover groups. The purpose of this – making sure that whether you are a teacher, head or year, head of house or anyone involved in intervention and all the way into SLT – you can show that you know and understand the level of progress a pupil is making towards end of year and school expectations. proportion of curriculum that the child has achieved towards the end of year or curriculum expectations last year. End columns are focusing on school based expectations. 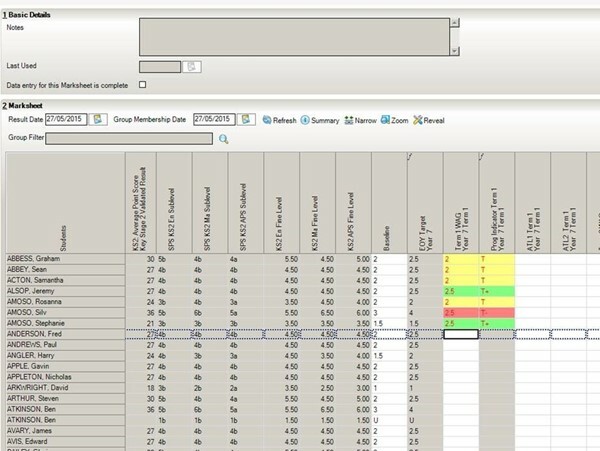 The flexibility doesn’t end there – you can drill down and filter to select key performance groups such FSM or EAL. You can also choose everything from all students right down to the individual child. This will show like a patchwork quilt, the different gaps and understanding across your groups of students. For most of the academic year (and some would argue back into last year too since the early rumours of change started circulating), there have been few accountability measures in place for Key Stage 3, so schools can choose an approach to suit them based on their priorities. Historically, this has been to use levels and points at KS3 or begin to adopt GCSE grades early. Both methods employed the use of an end of term summative assessment judgement and use grades or points values – a consistent approach to assessment across all key stages, although using differing grades. Rachael went on to say that “…we (Capita) appreciate the uncertainty around assessment has been challenging for schools…”, and part of the effort with engagement is to highlight some of the work already done around assessment, get more people talking about what can be done and shape the future – and of course, for me – and you the reader, get the inside track on what you can expect to see in the near future. As more information and guidance starts to slowly come out from the DfE and government – it is becoming increasingly clear there is an increasing focus on more regular ‘formative’ assessments and gaining an understanding of ‘what a child knows and does not know’ against what is being taught. Capita SIMS are supporting this approach across KS1 and KS2 and, Rachael and Lucy tell me, and have decided to support this across KS3 to encourage consistency and provide a comprehensive framework for assessing knowledge, skills and understanding against the curriculum being taught. In practice, this means that the new KS3 Program of Study will be included and available within SIMS, as it appears in the new National Curriculum. This will provide schools with the ability to track progress from nursery through to KS3 in detail if they choose. Unfortunately, as schools will know – this functionality missed the window for the Summer release, but the intention is to roll this and significant other changes into a focused release at Autumn. This fits in well with what Phil discussed at the annual conference in June – that future releases would be themed around capabilities and benefits that SIMS can bring; rather than being viewed as simply the three times a year compulsory update. For those schools that want to take advantage of this sooner – as promised back in June, a patch has also been made available now; which can be requested via your support team or Capita direct. Schools still have the freedom to assess however they choose. With there being no guidance from the DfE in time for the start of the academic year, it was inevitable that schools would want to prefer to maintain a system of summative assessments using a language of grades and points that they have become so familiar with. SIMS Assessment will aim to provide resources to support this, but also the newly released advice for KS3 and KS4 measures. This year has seen a big shift, a fundamental change to the way that students are assessed and tracked at Key Stage 4. This year’s Year 10 students will be the first to be taught the new curriculum in English Literature, English Language and maths, as well as being the first to be graded against the new 1-9 system. This school year is also the first that all schools will be assessed against the new Progress 8 and Attainment 8 measures. Alongside this focus on expected and actual progress is a new measure on ‘coasting schools’, which looks at how much students have improved over a span of three years. The concept is to provide a topic overview, and a collection of strands within a subject. Furthermore, schools will also be able to quickly and easily flag key skills as school based expectations. It will be possible to report on these, with the much improved reporting engine brought in in earlier SIMS updates. Rachael also updated me on the relationship with Partners, such as Learning Ladders. She told me that Capita are keen on facilitating data exchange between systems – particularly as there are not going to support really small steps within SIMS. There are specialist, mature assessment products on the market, and Rachael was quick to fill me in on the fact that they working with a number of other partners to support data transport between the specialist “deep” assessment systems. The principal is that partners such as Learning Ladders will deal with the finer granular steps – and her team would concentrate on making updates to facilitate data sharing in a common format. If your school has created its own assessment solution in SIMS, as many might have done, Capita had thought ahead and done some early work to support this area. Actually, this turns out to be an essential feature to help populate Capita pre-defined resources such as Marksheets, Tracking Grids, Analysis and Discover graphs; as well as power the school report functionality. Since we are dealing with numbers here – direct exports to Excel will be possible to allow even greater number crunching. One of the aims though is to allow much more data analysis within SIMS to save it having to be exported by Data Managers. SIMS has introduced a new utility enabling users to map Aspect and Result Sets that have been defined in school with those defined by Capita SIMS – this is known as the Mapping Tool. Once a school has mapped their assessment aspects and result sets to those provided by Capita, the associated assessment results will become visible within the pre-defined resources supplied by Capita and assessment results will also be displayed within the SIMS School Report. Its about more than this though – as it actually provides all the import and linking mechanisms needed to support matching of any school defined assessment measures. This is very powerful – and will then unlock the new advanced reporting capabilities within SIMS. Local support teams and Multi Academy Trusts will also be pleased to note that Capita are introducing an export and import facility to the mapping tool. If you support many schools using the same assessment resources you need only define an assessment ‘map’ once and then re-use the definition for all of the schools you support. Clever, and a nod to the new world we live in of schools supporting schools – and of course best practice. Development will continue at a pace – work on improving the “programmes of study” area is not complete. The next focus will be on data entry, which means of course the Teacher App. Marksheets are already supported; but this will be expanded with new views to access the statements of knowledge; and more excitingly, potential ways to evidence the knowledge. There is some back end work to do on this first – but this has great potential. I will be focusing in on Teacher App developments at a later date – once I have been able to discuss further with Duncan Hield – Product Manager. Many have asked whether there will be the potential to for customers to edit statements, this is on the priority roadmap – it is lower down list, but attempting. However, this will be more about small changes to the language used and not adding extra columns. The best way to think of this is that it will likely work as an overlay, and the good news is that the plan is that it will be possible to include this in the return to DfE. Finally, the hope is to add Key scales and SEN in either Autumn/Spring. As an aside, and as a twist to the close of this piece – I posed a question around the size of the development teams within Capita; with such efforts in products such as Assessment, the Teacher App, Behaviour – and of course vNext. I was surprised by the relatively modest team sizes. There is of course the sizable support team; but actually, development of product areas is taken on by a small focused team of developers, in the 10s – with slightly larger teams of business analysts. It is no wonder that the product managers are so involved, and also refreshing. Many across the education landscape will be pleased with the advice which has come from the DfE – which appears to have been the result of much more consultation with school leaders and education professionals. 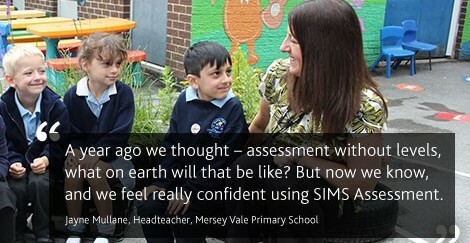 Rachael and her team were also involved in this process – and the result is guidance that already works with the direction of travel of schools who have started their “own” assessment methods, and the work that SIMS has already done. It is refreshing to see the industry working so collaboratively, and actually working to support better recording and monitoring processes to allow timely interventions. This entry was posted in Applications, Capita, Desktop, MIS by Stuart. Bookmark the permalink. Wondered if SPING was a new SIMS product for a moment! Really appreciate the blogs.